The fog hung over Dartmoor as we trudged past a tumbledown tor and headed down through bluebells to the valley on the other side . At the bottom was a wood and a bubbling, rocky stream. Not far from here is a hidden lake. We walked past oak trees in bud and moss-covered boulders to get to it, and then indulged in a secluded swim as trout jumped. This was a heavenly swim. Blistering day, millpond sea, and a pilgrimage to a cathedral-like arch. Swimming out was no effort at all, over grey and purple rocky landscapes covered with kelp forests. The water around the Rock was clear and green and deep, enabling lots of jumps and dives. 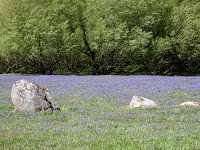 Bluebells, like Christmas, come but once a year. They're thought of as a woodland plant, but there are drifts of them all over Dartmoor, casting purple shadows across the landscape. They seem to grow happily amongst the granite outcrops. These were near Saddle Tor. We're lucky to be surrounded by lidos. 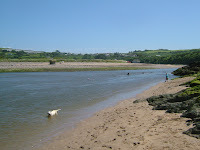 There are seven within twenty miles of our house, including Ashburton, Teignmouth, Moretonhampstead and Chagford. Today we patronised Buckfastleigh. The ladies' changing rooms had certainly had a facelift from last season. We are liking two-tone candy pink. Unfortunately, due to council paranoia about paedophiles, I wasn't allowed to take any photos inside the pool. Suffice to say it's surrounded by a lot of concrete but it's still lovely. Small and sweet. Outside, the pool is protected from vandals by barbed wire and sticky paint. Unfortunately the sign is not immune. My son is covering up the contribution made by the local scroats. High water was at 7:15, and we met at 8am (matchsticks in eyes) at Aveton Gifford, to drift, float and swim down the Avon estuary on the outgoing tide. Being pulled down the river, we felt intensely drawn into its world. We passed herons, egrets, cormorants and a nest of sleeping swans. Underwater I saw oyster beds, white cockle shells, and swathes of muddy kelp clinging to the banks. Around us the trees were in electric green bud, and fields of bluebells spread down to the water. Towards the end, the current sped up and it was an exhilarating ride - including being swirled in eddies - down to our final destination, the beach at Bantham. Lovers' leap is a legendary place on the Dart, somewhere I have long wanted to go, since reading the name on the Ordnance Survey map. There are various old prints of it, suggesting it was a notable beauty spot for the Victorians and the like. We found a rugged cliff face, with rusting fencing at the top. At the bottom, there is a slow, dark, tempting pool. In 1843, a Devon poet, John Bradford, was here. These are the opening lines of his "Sonnet written at Lovers Leap on the Banks of the Dart." Running the restless race in search of rest. Bantham was beautiful. Sun and sparkle, waves and wind. We lay around on the beach, looking across at Burgh Island. There were occasional forays into the sea, where the surf was small but sporting.